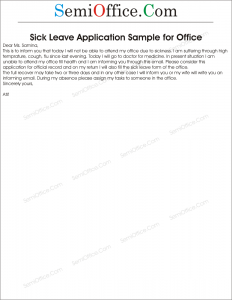 Sample leave application for office due to brother’s illness because of fever, vomiting, food poisoning etc. It is to request you to grant me leave for today i.e. 17th August, 2015 as my parents are out of town and my younger brother is suffering from high grade fever. He had been vomiting and shivering all night and still feels unwell. My parents will be back home by evening therefore, I request you to grant me leave for a day so that I can care for my sick brother. I am Hamza Shehbaz, Assistant Manager Administration want to go on one week leave due to illness of my elder brother. My brother is suffering from Sugar since years but now his condition is very severe. Yesterday due to high Sugar he fell down on the floor and get some bone injury in the left arm. My mother asked me to take him to hospital for the treatment of his arm. So I am requesting you for one week leave from the office. I will be thankful to you. It is stated that I, Azeem Gill have been working in your school as English teacher for the last 4 years. As far as my family members are concerned, I am living with my parents & 1 younger brother. My brother is suffering from food poisoning for 2 days. He is taking complete bed rest but last night his condition became worst. So I took him to city hospital where the doctor admitted him for the treatment. As I need to stay in the hospital because my parents are out of country yet. So I request you to please grant me leave for today. I will be thankful to you for your kindness. Sample leave application for one day from office, company, factory or job due to any reason. I wish to inform you that tomorrow is our festival onam. So please kindly grant me one day leave. I am George Geillo, Executive Accountant at Jaleeb Foods Pvt. Ltd writing for one day leave due to work at home. I am informing that I will not be available for one day on 10th April and submitting this application for prior permission. During my absence my colleague will manage all the necessary tasks on that day. Looking for your approval and thanking you. I Khalid Asgher have been working as a volunteer in your department. I was ill and could not come to work on 8th April 10, 2015. I kindly request you to grant me leave on the above mentioned day and make this leave as an informed leave. As per our conversation a week ago, I have to apply for the job of associate professor at a renowned university at Islamabad. On spot job interviews have been scheduled for tomorrow. I request you to kindly grant me leave for a day i.e. on 18th August, 2015 so that I can look into availing this opportunity. I shall be very grateful to you for your kind assistance in this regard.